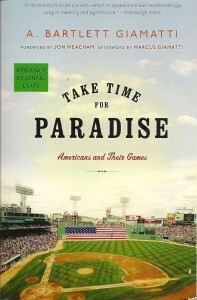 Take Time for Paradise: Americans and Their Games by A. Barlett Giamatti. New York: Bloomsbury, c1989, reissued 2011. It seems a bit odd to be writing an “early review” of a book published in 1989, but I’m pleased that Bloomsbury chose to reissue this classic, originally a series of lectures, adding a foreword by Jon Meacham and a touching afterword by Marcus Giamatti (son of the author). 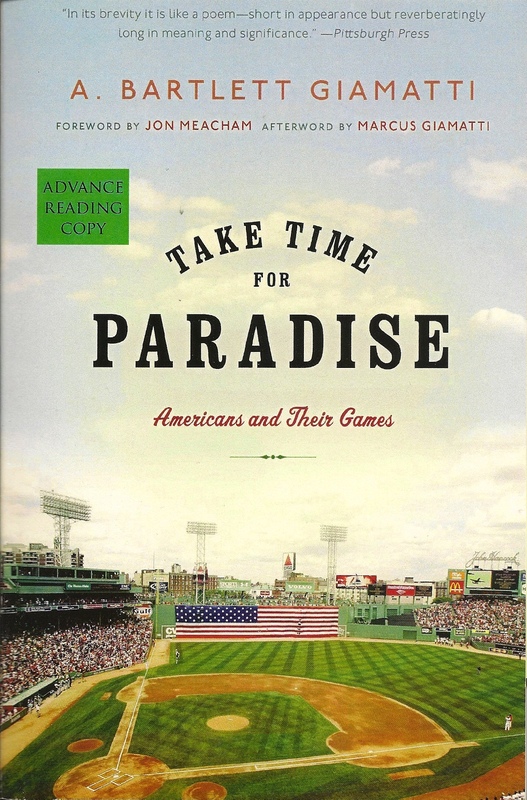 Take Time for Paradise explores leisure activity, including sports in general and baseball in particular, using the tools of philosophy, classics, and literature. Giamatti invokes Shakespeare, Aristotle, and Homer in his explorations of “Self-Knowledge,” “Community,” and “Baseball as Narrative.” If this description has you rolling your eyes and yawning, imagining an “ivory tower” analysis of your favorite activity, think again. Giamatti was a scholar, but he was also a die-hard baseball fan—two characteristics which made him a good National League President and (briefly) Commissioner of Baseball; they also allow him to analyze baseball in interesting and thoughtful ways. The first chapter/lecture, “Self-Knowledge,” sets the stage by examining the meaning and purposes of “leisure” as “not-work.” Leisure is all about freedom; how we choose to spend our time when we are free to make that choice. Leisure is how/when most of us seek fulfillment, aspiring to our vision of paradise. To me, the most interesting passages in this chapter addressed the idea that sport is (like) religion. Giamatti acknowledges the similarities in terms of sacred connections, rituals, and notions of paradise, but maintains that the self-transformation of leisure/sport need not be described in religious terms. The second chapter/lecture, “Community,” explores sport as inherently connected to cities, rather than rural/garden/suburban contexts. Here Giamatti addresses several sociological issues related to sports including drug/alcohol/steroid use, the danger of the cult of the young athlete, various forms of cheating, and the role of the spectator. He also foreshadows many of the “modern developments” (e.g., giant scoreboards) and the need to accommodate both new and old fans. “Baseball as Narrative,” the third chapter/lecture brings the themes of leisure, freedom, and community together in showing how baseball is about story. The “plot” becomes a literal “plot of soil” in a whirlwind tour of the geometry and details of baseball fields. The meditation on “home” manages to include family, Homer’s Odyssey and Romance. Giamatti ties the series of lectures together by ending with a story of a hotel lobby during the World Series. In other words, all that repetition provides the framework for the quirky, unique story that is any particular baseball game. Once you know that framework, and its rhythmic comforts, you can sit back (or on the edge of your seat) waiting for today’s story to unfold. Giamatti goes on to compare this energy within rules to how the language of sonnets works: “The point being that freedom is the fulfillment of the promise of an energetic, complex order.” (p. 80). I wept all the way through Marcus Giamatti’s afterword, a son’s tribute to and appreciation of both his father and the connection forged by a love of baseball. If you find the most compelling thing about baseball to be statistics and fantasy teams, this probably is not the baseball book for you. On the other hand, if you appreciate how scholarly analysis can combine with genuine enthusiasm to provide insightful musings on almost any activity, you will enjoy this book. The writing style is very accessible (most musical concepts are clarified in everyday language so even non-musicians can follow along). I particularly appreciated Fleisher’s ability to look back on some of his less-than-admirable times/behaviors with both wisdom and wit. 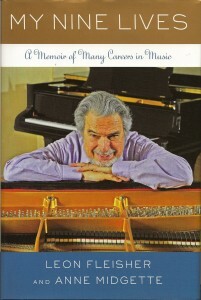 The photos at the beginning of each chapter and in a separate center section provide the reader with a glance into the full span of the author’s life. My only criticism would be that there is some repetition of points and stories, which seemed unnecessary as I was reading the book cover-to-cover, but in this age of reading excerpts and single chapters, I suppose they will be helpful to some readers. 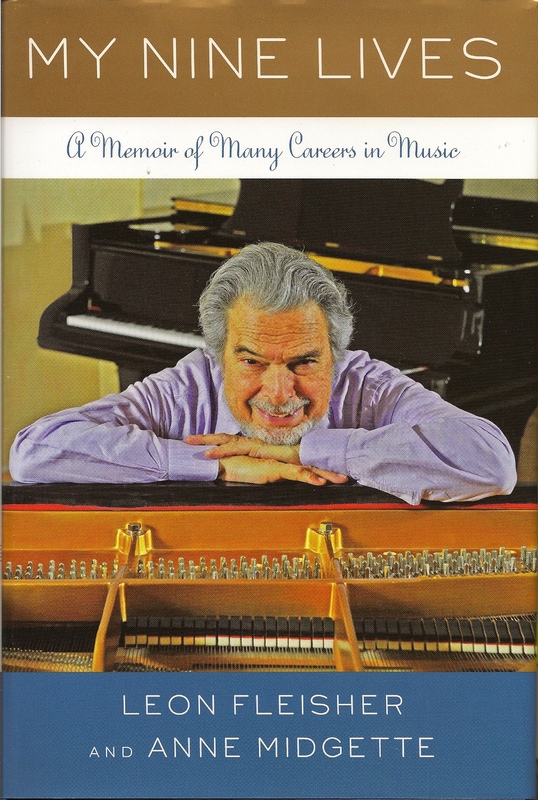 I would recommend this book to anyone struggling with a career ending/changing injury as well as to any up-and-coming young musicians out there. The five “Master Class” sections inserted amongst the ten chapters are also helpful and interesting. Each is a brief (almost too brief) but insightful commentary revealing one musician’s way of thinking about a particular piece: Brahms’ Piano Concerto No. 1 in D Minor; Beethoven’s Piano Concerto No. 4 in G Major, Op. 58; Ravel’s Piano Concerto for the Left Hand in D Major; Mozart’s Piano Concerto No. 25 in C Major, K. 503; Schubert’s Sonata in B-flat Major. I only wish I had read the book before Fleisher came to town a few weeks ago. I would have made sure to get a ticket. Instead I will have to make due with listening to some of his many recordings (a selected Discography is included at the back of the book). 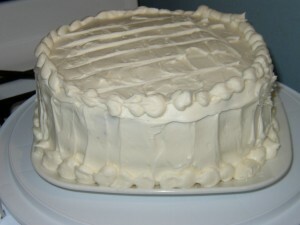 After many requests from friends, I finally made my first attempt at Red Velvet Cake. 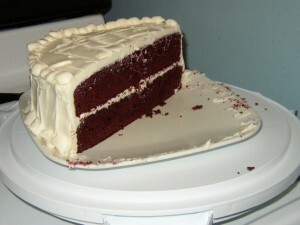 I intended to make the Dark Chocolate Red Velvet Cake from the All Cakes Considered book by Melissa Gray, but after reading some negative reviews (e.g., http://www.annarbor.com/entertainment/food-drink/red-velvet-cake/ ) and noticing that the ACC recipe used much more butter and sugar and many more eggs than any other recipe I could find, I decided to do one of my “recipe-mergers” where I combine the ingredients and techniques from several recipes into one that makes sense to me. Links to the three recipes I ended up combining are at the end. 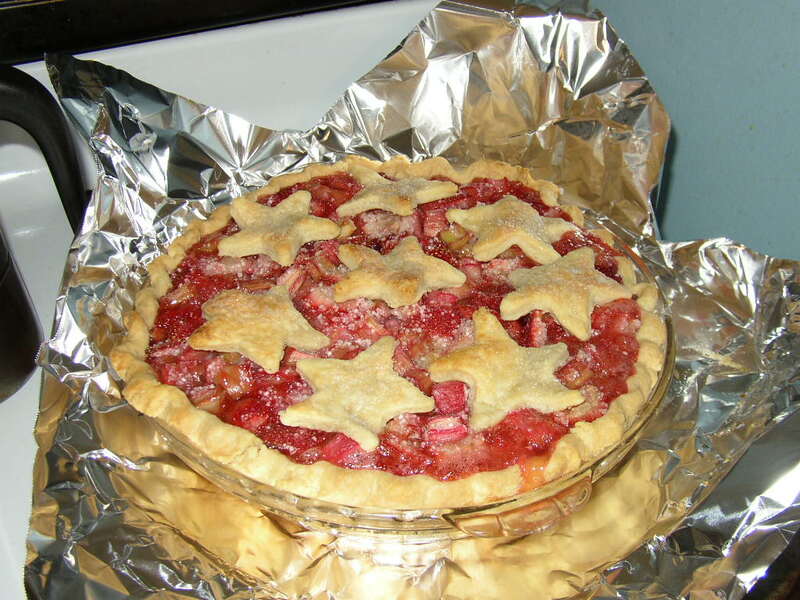 The only thing I retained from the All Cakes Considered version was using sour cream instead of buttermilk (because I had already bought sour cream for the cake and didn’t want to waste it). You can find both the cake and frosting recipes here.